Partial pressures of CO2 and CH4 were measured directly or calculated from pH and alkalinity or DIC measurements for 25 lakes and 4 rivers on the North Slope of Alaska. Nearly all waters were super-saturated with respect to atmospheric pressures of CO2 and CH4. Gas fluxes to the atmosphere ranged from −6.5 to 59.8 mmol m−2 d−1 for CO2 and from 0.08 to 1.02 mmol m−2 d−1 for CH4, and were uncorrelated with latitude or lake morphology. Seasonal trends include a buildup of CO2 and CH4 under ice during winter, and often an increased CO2 flux rate in August due to partial lake turnover. 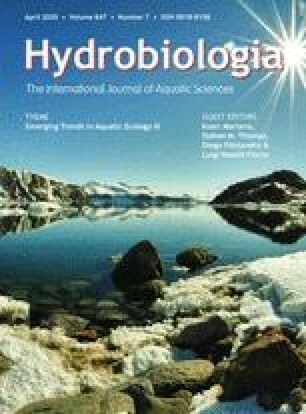 Nutrient fertilization experiments resulted in decreased CO2 release from a lake due to photosynthetic uptake, but no change in CO2 release from a river due to the much faster water renewal time. In lakes and rivers the groundwater input of dissolved CO2 and CH4 is supplemented by in-lake respiration of dissolved and particulate carbon washed in from land. The release of carbon from aquatic systems to the atmosphere averaged 24 g C m−2 y−1, and in coastal areas where up to 50% of the surface area is water, this loss equals frac 1/5 to 1/2 of the net carbon accumulation rates estimated for tundra.